Your gifts under the tree should be as picture-perfect as the rest of your Scandi-inspired home. 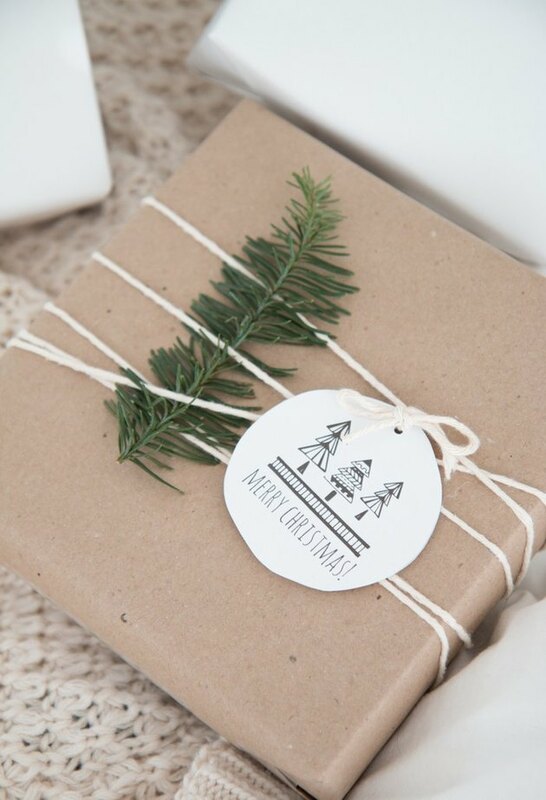 Pair simple wrapping paper with cute gift tags like these adorable minimalist numbers by Andrea from The Beauty Dojo. This year, skip the gilded or mercury candleholders for your holiday table. This DIY project from Carola over at Vienna Wedekind uses water and an evergreen branch to create a beautiful nature-inspired option. These geometric Himmeli (or traditional Finnish ornaments made out of straw or reeds) and bead strands by Pinja from Pinjacolada are easy to make yourself — all you need are some rye straws, wooden beads, and white paint. 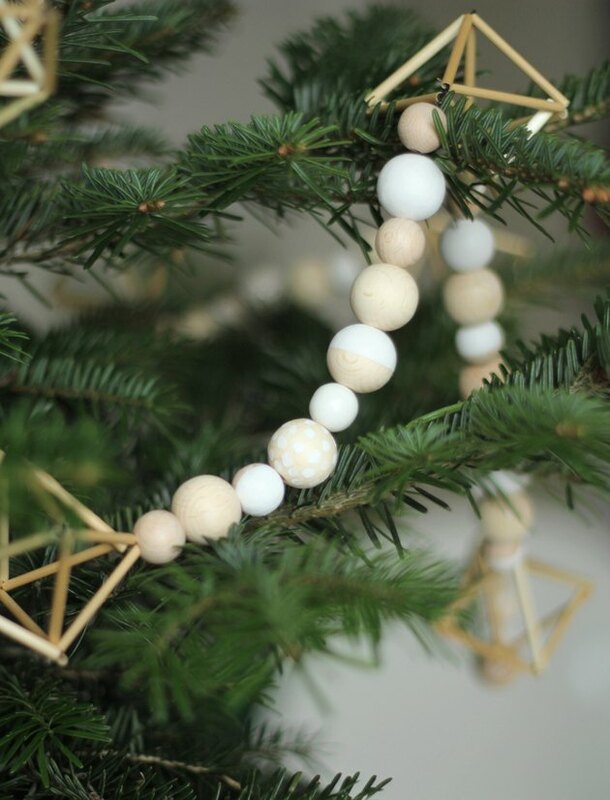 String with beads to create a swanky garland that you can wrap around your tree to give it Nordic appeal. 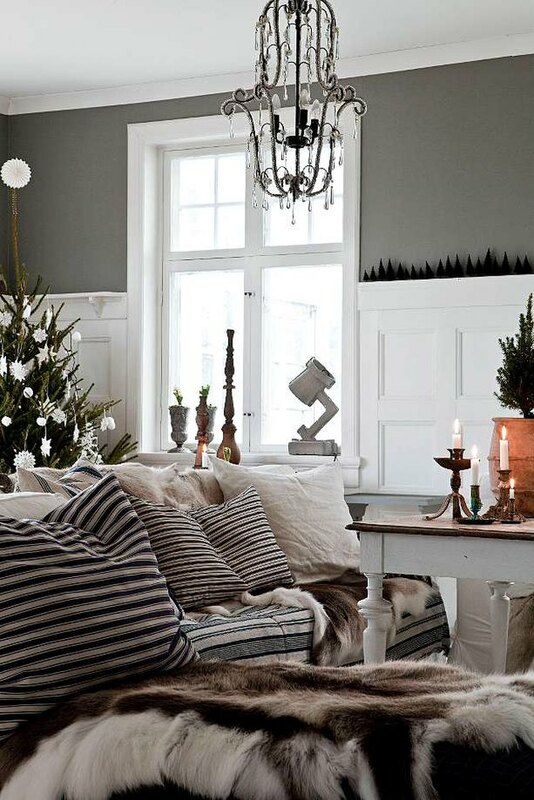 Scandinavian neutral interiors make the perfect backdrop for holiday celebrations. Fill your mantel with creamy pillar candles and choose one bold accent color, like deep navy blue. Struggling to pull together your holiday tablescape? 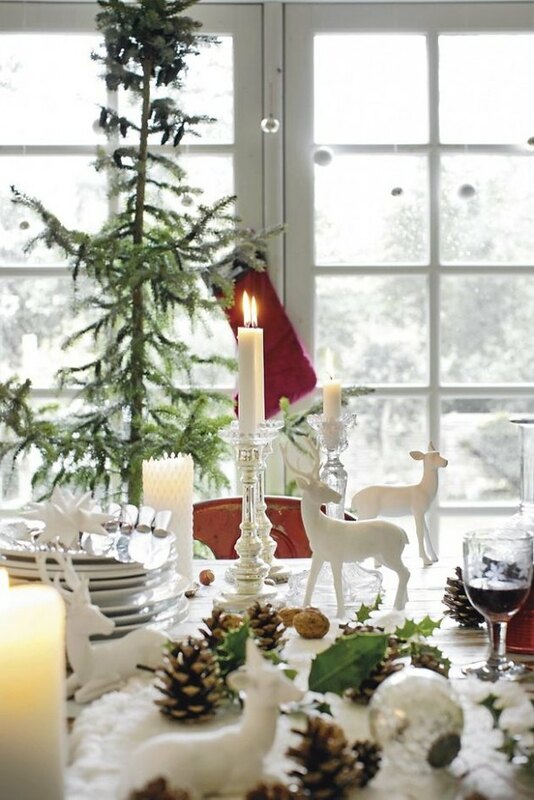 White miniature deer accent a ruffled table runner, white plates, and — of course — white walls give Aimee's dining room scene a winter wonderland feel. 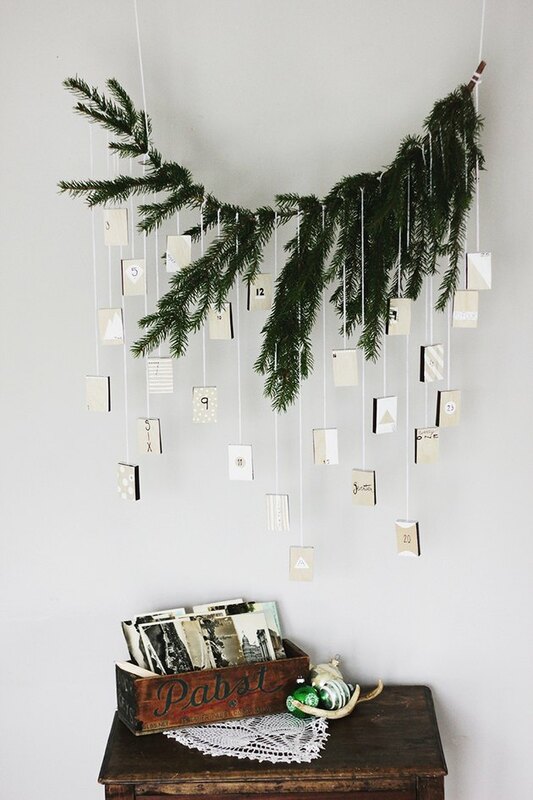 Skip the store-bought advent calendar in favor of this Nordic-inspired number hanging from an evergreen limb. Caitlin over at The Merrythought painted matchboxes for each day. Inside, she hid the names of her relatives and committed to mailing a postcard every day. Not interested in setting up a bulky, Christmas tree in your living room or do you simply lack the cash? 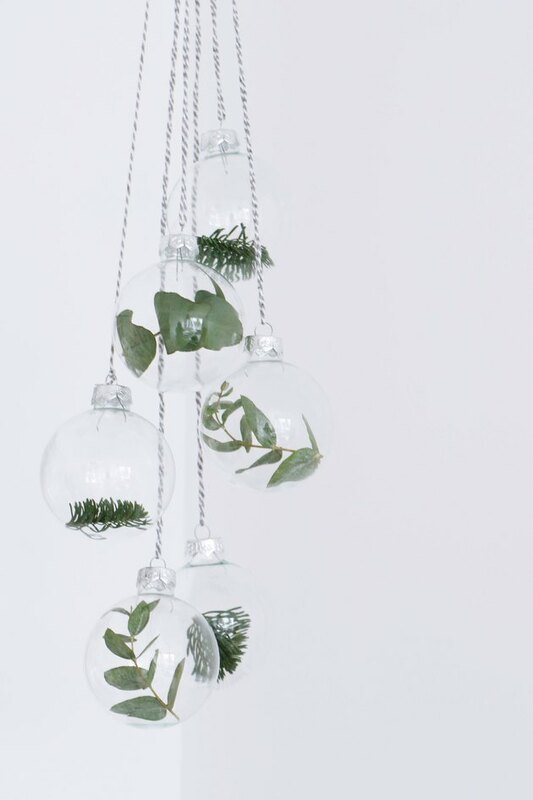 This streamlined glass-ornament mobile (find the instructions here) gives a hint of greenery without taking up precious floor space. There's no need to go overboard in order to feel the holiday spirit. 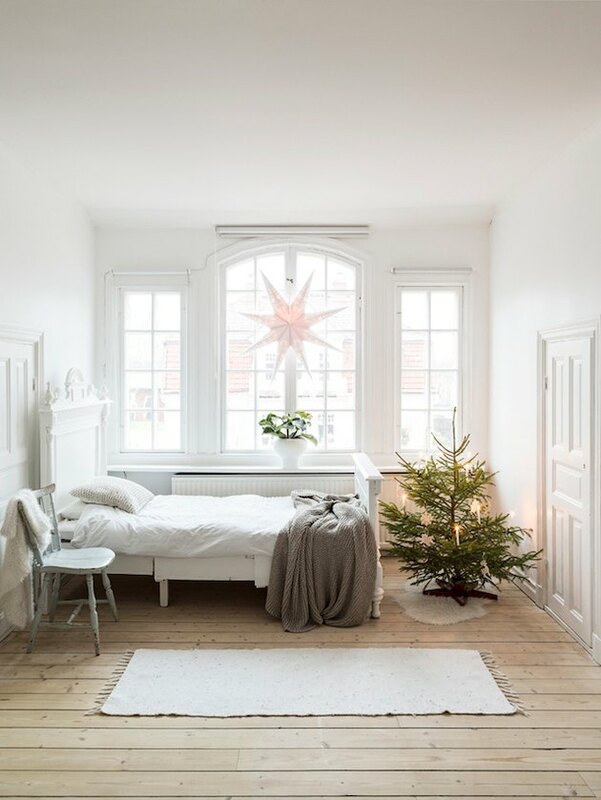 If you're outfitting a small space think minimalist Scandinavian-style: a small tree, a smattering of lights, and a single white star hung in the window. Not all Scandi-inspired interiors need crisp, perfectly curated white accessories. 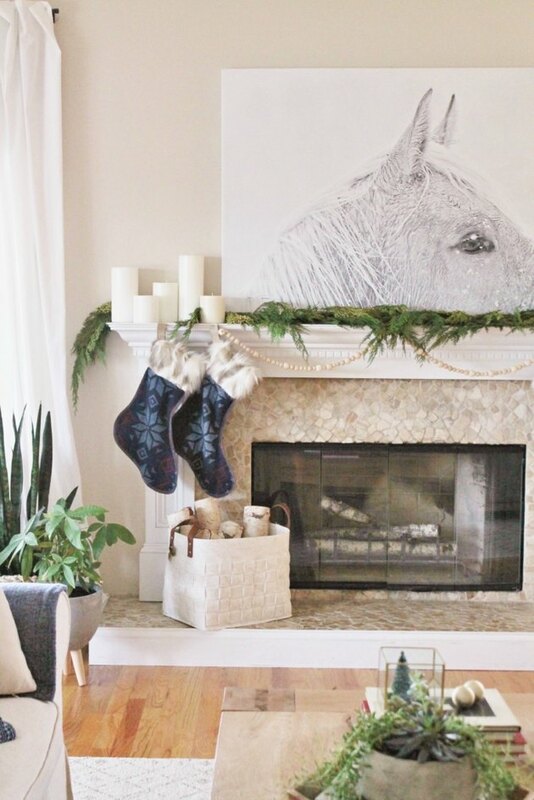 A bit of rustic decor can add to the overall charm, making your home even cozier for the holidays. Pink may not be considered a standard seasonal shade, but paired with traditional Scandinavian decor, it makes sense. 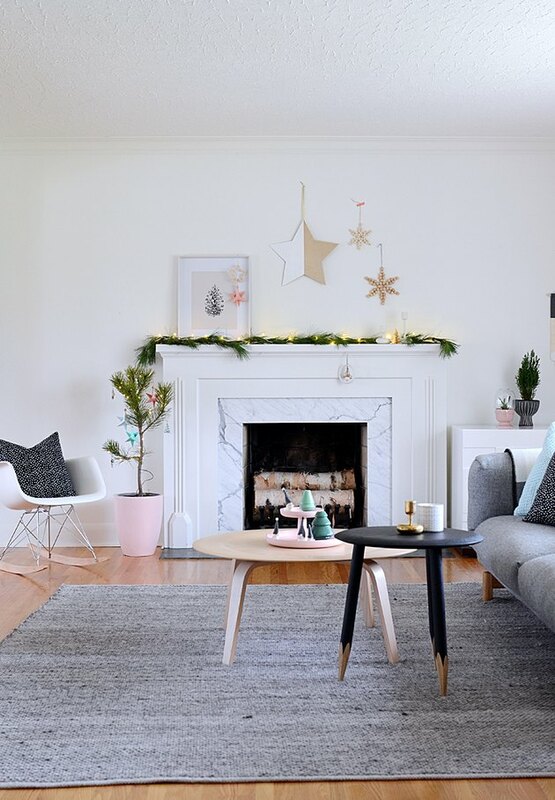 Add blush accents like Anu from Nalle's House did in her living room to keep your home feeling festive and bright — just take care to not over do it. 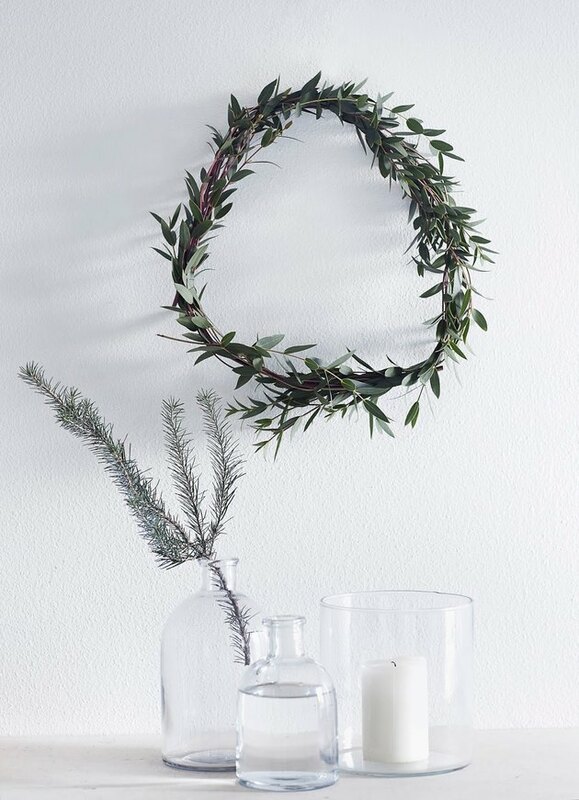 Minimal wreaths made from evergreen twigs are, of course, stunning. 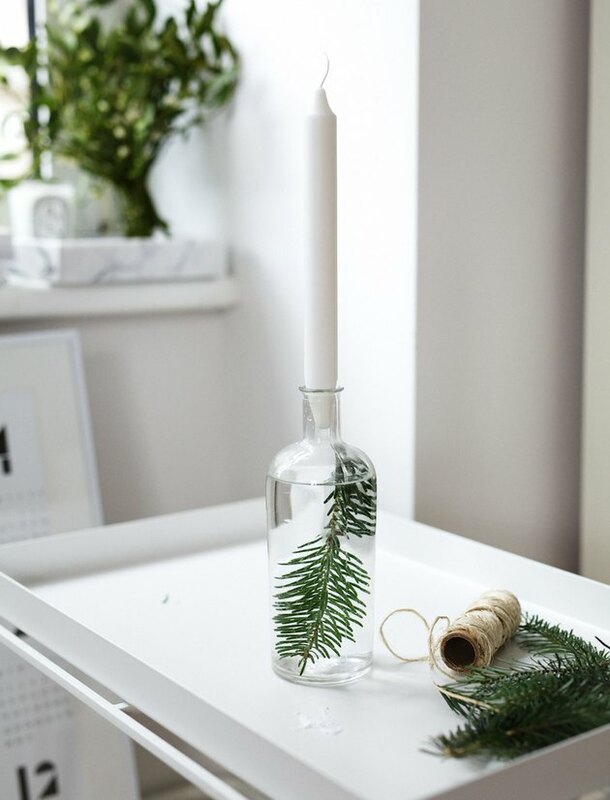 But this so-simple-it-hurts eucalyptus variety from Riikka over at Weekday Carnival is a to-die-for addition to an all-white, Nordic-chic wall. There's no need to outfit your tree with elaborate, store-bought decorations. 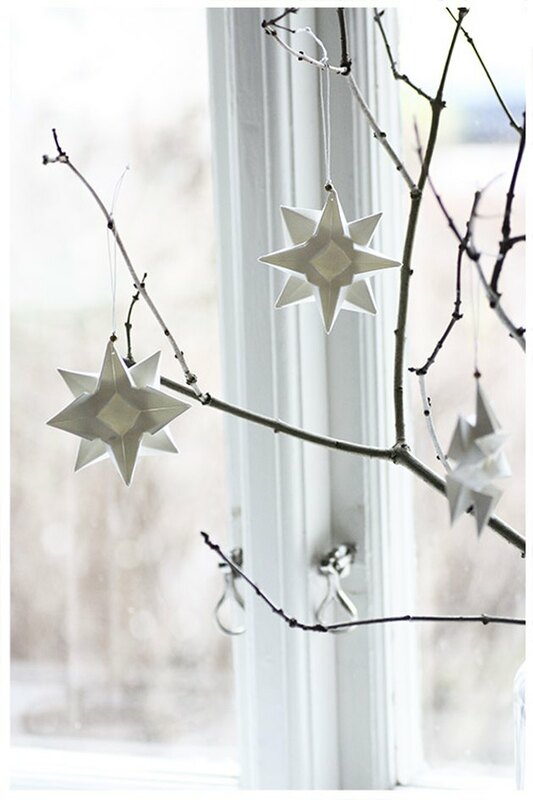 White paper stars bring a cheery, seasonal vibe — and can be easily made at home. 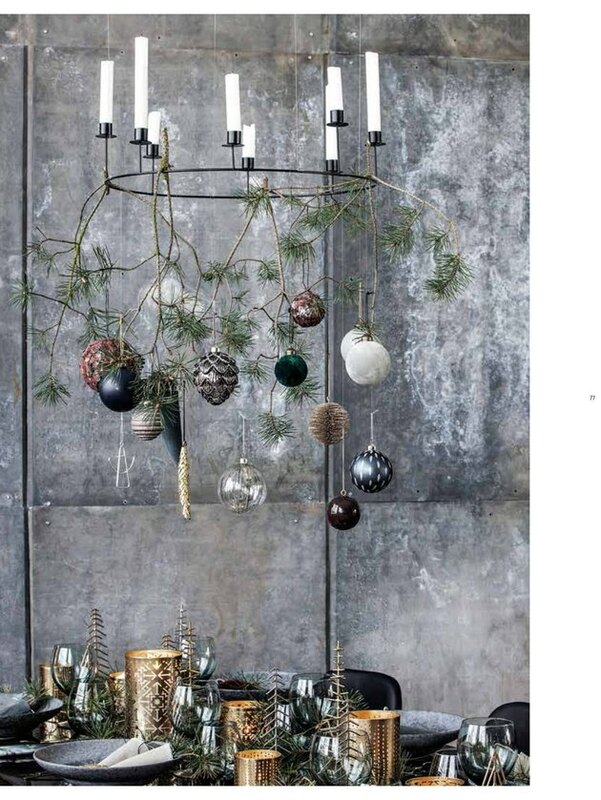 Decorating for a holiday dinner party? Hang evergreen twigs and your favorite ornaments from the candelabra chandelier to create one-of-a-kind lighting and picture-perfect ambiance.